The first and unique wine accessories shop of Turkey is open under the name of “Şarap Takıları ve Şarap Aksesuarları” from 09:00 to 21:00 daily, across the church (follow the wine glass shaped street signs !). Anything you can imagine about the wine accessories and may be something surprising could be seen in that shop.Either functional or decorational objects are all together under the same roof. Unique, hand made wine jewelleries, called “Şarap Takıları”, could only be bought in the shop and www.saraptakilari.com on-line shopping website run by Bozcaada Biz firm. 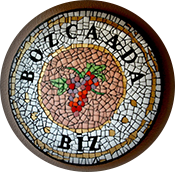 In order to complete the wine ambient of Bozcaada, you beter not miss that unique shop like a toy shop for wine enthusiasts, with hundreds of wine related products.